Masters Gallery Foods (and it’s usually a lot)! For more information, or a complete list of all program participants, go to: http://www.greenmastersprogram.com. Both Kevin and Tom are available for any additional questions. Sheboygan, Wis. – At its Annual Meeting on November 14, the Sheboygan County Economic Development Corporation (SCEDC) presented its annual “Sheboygan County Economic Driver of the Year” Award to Masters Gallery Foods. Elkhart Lake, WI—The Chamber Champions Gala, held on February 20, 2018, was a time to celebrate the best of Sheboygan County. More than 650 attendees gathered to celebrate the accomplishments of the Chamber Champion award nominees with a rousing reception, excellent food and standing ovations at The Osthoff Resort. Over 76 companies and organizations were nominated for various awards. Masters Gallery Foods was honored to receive the Manufacturer of the Year award. This did not come easy as they were against some other great businesses, including 3 Sheeps Brewing Company, American Orthodontics, Bemis Manufacturing Company, Kohler Co., Sargento Foods, The Blind Horse Restaurant & Winery and Wigwam Mills. The annual award process began in Fall when the Chamber put out a call for nominations from their members for their members. If nominations were not Chamber members or were self-nominated, they were disqualified. Nominees are then sent category-specific questionnaires. Chamber member representatives from a variety of fields are asked to be judges and personally go through the questions, score and tally the nominations individually. Judges then gather to review score sheets, percents are tabulated and the winner is determined (judges with affiliations to the nominees are unable to vote in those categories). Since its founding in 1974, Masters Gallery Foods has grown to service many of the nation’s grocery chains, wholesalers, restaurants, and distributors with a full line of private label brand cheese and cheese related products. The Company also specializes in the procurement, aging, and distribution of bulk cheeses at a national level. For more information, visit the company’s website at www.mastersgalleryfoods.com. 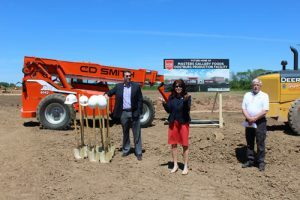 Masters Gallery Foods held a groundbreaking ceremony on June 7, 2017 for their new Packaging and Distribution facility in Oostburg, WI. 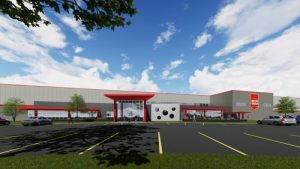 The new facility will allow the company to drive continued growth of their private label brand retail and food service cheese offering sold throughout the country and will support the company’s original plant and corporate headquarters in Plymouth, WI. Joining them was Wisconsin LT. Governor- Rebecca Kleefisch, State Senator Devin LeMahieu, District 26 Representative- Terry Katsma, Oostburg Village President- Allen Wrubbel, Oostburg District Superintendent- Kevin Bruggink, Sheboygan County Economic Development Corporation- Jim Schuessler, Wisconsin Economic Development Corporation- Barb LeMue and Mary Perry, Representatives from CD Smith, Wagner Excavating, McMahon Engineers, BMO Harris and Wells Fargo Banks respectively. PLYMOUTH, Wis. – December 12, 2016 – Masters Gallery Foods, Inc. has announced plans to build a new packaging and distribution facility in Oostburg, WI. 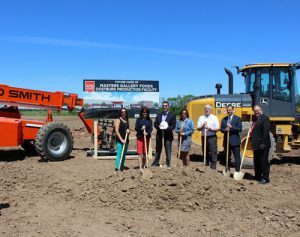 The new facility will allow the company to drive continued growth of their private brand retail and food service cheese offerings sold throughout the country and will support the company’s original plant and corporate headquarters in Plymouth, WI. “We’re thrilled to be embarking on our second production facility. It’s a proud moment for the company and all our associates, and we hope it’s exciting for the local community as well,” says Jeff Gentine, CEO and co-owner of Masters Gallery Foods. The Oostburg plant will be built on a nearly 40-acre parcel of land recently acquired by the Village which will be annexed into the adjacent Business Park. While the design is still being finalized, Phase 1 of construction is expected to be roughly 150,000 square feet. The master site plan will accommodate 2 additional expansions for a total footprint of approximately 350,000 square feet. Groundwork and site preparation for Phase 1 are expected to begin next spring, with occupancy by early 2018. The new production facility represents a significant investment in Sheboygan County and the surrounding community. Phase 1, estimated at $30 million, is expected to result in roughly 120 new jobs over the next 2-3 years while the master plan has the potential to create an additional 200 or more jobs. 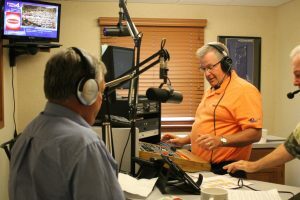 Oostburg was deemed an ideal location thanks to its proximity to Highway 43 and the ability to attract new employees from both the north and south. The Wisconsin and upper Midwest cheese supply continues to grow as well, so increasing capacity near steady, high quality supply was another strong consideration for the company and its expanding customer base who rely on quality cheese. The company’s main production facility in Plymouth was originally built in 1989. Starting off at a modest 40,000 square feet, the plant has increased in size over 3 expansions to approximately 310,000 square feet. Today the company runs multiple production lines for shredding, slicing, chunking and sticking of natural cheese, and employs nearly 600 associates company-wide. About Masters Gallery Foods, Inc. Since its founding in 1974, Masters Gallery Foods has grown to service many of the nation’s grocery chains, wholesalers, restaurants, and distributors with a full line of private brand cheese and cheese-related products. The Company also specializes in the procurement, aging, and distribution of bulk cheeses at a national level. For more information, visit the company’s website at www.mastersgalleryfoods.com. Congratulations! The Wisconsin Sustainable Business Council is delighted to recognize Masters Gallery Foods, Inc. as a Green Professional under the Green Masters Program. The enclosed certificate recognizes Masters Gallery Foods outstanding dedication to integrating principles of sustainability into its operations while pursing business excellence. In earning this certificate, Masters Gallery Foods stands out in Wisconsin’s business community. The Green Masters Program recognizes Wisconsin organization that have integrated sustainability into their business plans. As you know, the program is grounded in an in-depth survey where points are rewarded for a variety of actions. These actions are grouped into areas that include: Energy, Climate, Water, Waste Management, Transportation, Supply Chain, Workforce, Governance, and Community and Educational Outreach. The Council applauds your leadership in these areas and encourages you to continuously challenge yourselves to improve. The Green Masters Program not only gives you an overall sustainability score, but provides a score in each of the sustainability areas defined by the program. Masters Gallery Foods has distinguished itself with exceptional scores in Education and Outreach, Waste Management, and Governance. Within your industry, it is increasingly important to integrate sustainability into all aspects of business operations, and your efforts can help shape the behavior and performance of other Wisconsin businesses. A company’s final score will land them in one of three classification; Green Apprentice companies score between 9 and 250 points, Green Professional companies score more than 250 points, and Green Masters companies are the top 20% of businesses in the program in a given year. Because new companies are constantly submitting new applications to the program, we encourage you to resubmit your survey each year. We would welcome the opportunity to work with your staff on the development of a press release celebrating your participation in the Green Masters Program. If you are interested in developing a press release, we can provide a template and examples to work from. We’d like to once again thank you for your leadership in the sustainability area and welcome you into the Green Masters Program. PLYMOUTH, Wis. – October 27, 2016 – Masters Gallery Foods, Inc. announces the company has been recognized by Deloitte on their annual Wisconsin 75 list, for the 14th year in a row. The Deloitte Wisconsin 75 recognizes the state’s largest privately and closely held companies headquartered in Wisconsin for the impact they make on Wisconsin’s communities and economy. This year, Masters Gallery Foods is honored to rank 23rd on the list. Companies from 41 cities in the state were honored, with 28 manufacturing companies being the largest sector; collectively generating $32B in revenues. Even more, nearly 100 percent of the companies included in the Wisconsin 75 give back to their communities by donating time and money to important community initiatives. “We are extremely honored to be recognized as this is a nice reflection of what our employees have been able to accomplish this year,” says Jeff Gentine, executive vice president for Masters Gallery Foods, Inc. Winners were highlighted in the Milwaukee Journal Sentinel as well as recognized at an awards ceremony on October 4, 2016 at Pier Wisconsin in Milwaukee. Keynote speaker Paul Purcell of RW Baird, said the contributions of private companies play an important role in powering the state’s economy and communities. Since its founding in 1974, Masters Gallery Foods has grown to service many of the nation’s grocery chains, wholesalers, restaurants, and distributors with a full line of cheese and cheese-related products. The Company also specializes in the procurement, aging, and distribution of bulk cheeses at a national level. The Masters Gallery family is 580 employees strong and growing. For more information, visit the company’s website at www.mastersgalleryfoods.com. Plymouth, WI (April 12, 2016) – Masters Gallery Foods, Inc. was honored with two Best of Class Awards at this year’s World Championship Cheese Contest held in Madison, Wisconsin. Judging took place March 7-9, and Masters Gallery received Best of Class in two categories: Open Class Shredded and Cheddar, Aged One to Two Years. The company also received Third Place in Open Class Shredded and Third in Cheddar, Aged Two Years or Longer. Named as a Wisconsin 75 company and recognized as one of the top privately held businesses in Wisconsin for 13 consecutive years, Masters Gallery Foods is a leader in the retail and food service private label cheese packaging and distribution business. The company services many of the nation’s grocery chains, wholesalers, restaurants and distributors with a full line of cheese related products. The Masters Gallery family is 530+ employees strong and growing. For more information, visit the company’s website at www.mastersgalleryfoods.com. Lt. 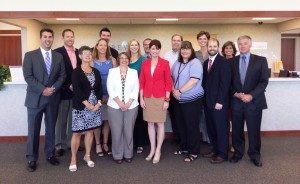 Governor Rebecca Kleefisch met with the Center for Health and Wellness company partners, staff and Prevea to discuss their innovative health care and employee wellness initiatives. View the USDA article here. Fuerst Promoted at Masters Gallery Foods, Inc.